Blame it on an unidentified "medical mission bug," which inspired me to my second medical mission this year. In mid-February of this year, I returned completely overjoyed with happiness after participating in a medical / surgical mission in Daet, Camarines Norte. I joined a group of volunteers from the San Francisco Bay Area, mostly physicians and nurses from Kaiser Permanente Richmond Medical Center, and the Contra Costa Regional Medical Center. I was terribly homesick, having been away from my native country for more than twenty-five years. Yes, it was November 1986 when I last visited the Philippines, a trip which I took mainly as an early lesson in ancestry for my four-year old. He is now thirty years old, and recently got married. The experience I gained from Daet was so fulfilling that just as soon as I recovered from jet lag and returned to my usual routine as a night shift Critical Care nurse at Kaiser Permanente, I began to inquire on other medical missions. I spent my free hours on the computer, and Googled, Googled, and Googled some more. Finally before the end of February, I came upon "The Association of Philippine Physicians and Allied Professionals of Arizona." I wrote an email, addressed to Dr. Ernest C. Lee, who responded to my letter within a few hours. Since that time, Dr. Lee and I had been in regular correspondence. Planning and organizing the medical mission for October 2012 did not come without any challenges; but thanks to the leadership, commitment, and zeal of APPAPA, the medical-surgical-dental mission came to fruition on October 8-12, 2012. Our U.S.-based team comprised mainly of participants coming from Arizona. Yet there were some coming from Southern California, from Washington D.C., and myself, from Northern California. My knowledge of the mission participants was limited through a number of email exchanges in a span of seven months. That added to my sense of adventure -- sort of like going on a "blind date." I certainly knew in my heart that we were going to the Philippines for one common goal: SERVICE. That commitment to service was demonstrated in how we conducted ourselves during the week. We gave an initial impression to the physicians, various staffs, and employees of Santa Ana Hospital that we came from one central location in the United States. Our team worked cohesively and effectively. We showed mutual respect and consideration; a willingness to support and extend assistance to each other. Our team collaborated with our Philippine-based counterparts of physicians, dentists, and nurses. What an amazing collaboration and teamwork !!! Several patients received care at the Medical Outpatient Clinic, and Dental OutpatientClinic. Medical, surgical and dental supplies were collected and gathered from different hospitals in the U.S., and the shipments came in time for the mission. Boxes of pharmaceutical supplies were dispensed in the outpatient clinics, and to the surgical patients. My experience as a Registered Nurse came full-circle when I had the humble opportunity of interacting with the parents of the children who were undergoing cleft lip and cleft palate surgeries. I spoke to a young mother on the first day of surgery. Her daughter was eleven months old. She shared with me that on her second trimester (the fifth month of her pregnancy), an ultrasound was done; the physician later informed her and her husband that the baby would be born with a deformity. “We learned to love and accept her just the way she was given to us." And now she was about to hand off her baby to us; she placed her complete trust and hope in our team. I reassured her that I would remain with her baby throughout the surgery, and that I would bring her back out for post-operative recovery care. Within a few hours, we brought her baby out to the Recovery Room. The young mother was anxiously awaiting to see her baby; I saw her eyes welling up in tears. One could not hold back tears during that precious moment; this was a genuinely humbling opportunity for service. After completing the recovery care, the baby was transferred to the 6th floor for an overnight stay. The team visited the baby and her family who thanked the team profusely for the service we rendered. The baby was resting very comfortably. She had finished her first 4 ounces of milk, and was ready for her second bottle. This little boy was seven years old, but he was smart and active. When I explained the contents of the surgical consent to his father, the boy insisted on writing his full name on the line provided stating, "I am in second grade, and I know how to write my name." -- and he did so quite legibly. Just as I did with the younger baby, I reassured the little boy and his father that I would remain with him for the duration of the surgery, and would bring him out for recovery care. Just as the young mother, this little boy's father also had tears welling up in his eyes, and in order not to embarrass himself, he pulled a pair of sunglasses from his shirt pocket, and put it on. Those were genuine tears of joys and gratitude. Richmond, California U. S. A.
Ms. Geneva Baruelo, a premedical student at the University of Arizona, participated in her first medical mission to the Philippines as part of the a Fil-Am Memphis team this past May 2011. Geneva contacted APPAPA through our website. An APPAPA member was able to contact a former colleague in Memphis to help coordinate Geneva's trip. This is an example of how APPAPA can help guide Filipino premedical students in Arizona to enhance their applications for medical school, and to develop a social conscience to return home to the Philippines and help patients in need. forward to hopefully joining them again next year if possible. of the doctors since her nurse assistant had to go on duty that day. doctors did for this mission. There are many organizations that organize medical missions to the Philippines. The logistics of organizing a medical are formidable. Additionally, accounting of medical supplies and monetary donations can pose a challenge. Thus, joining a larger organization that has the logistical and political footprint to pull off such a challenging endeavor is a great way to participate on a medical mission and help our fellow brothers and sisters in the Philippines. Once you go, I promise you will never be the same - the first-hand experience of delivering life-saving measures and helping those most in need will humble you and touch your life in ways that words cannot describe. The gratitude of the people will bring tears to your eyes. Medical missions are hard work, but I find myself always longing to participate on more as I cannot forget the long lines of patients that we have to leave behind on the last day of a mission because we have run out of time and resources. 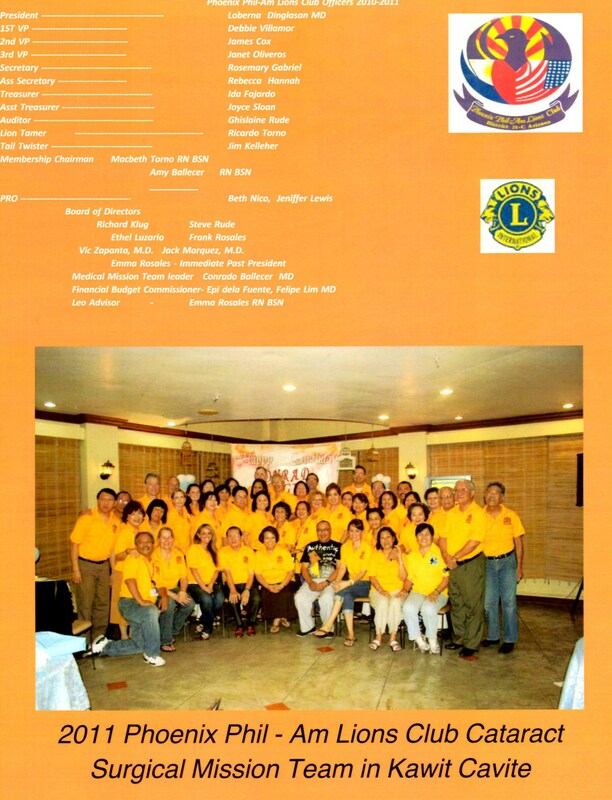 Thank you to the 2011 Phoenix Phil-Am Lions Club Cataract Surgical Mission Team who completed their project in Kawit, Cavite, Philippines. Helping Hands Medical Mission completed their one-week mission in Tanauan-Batangas, Philippines on February 26, 2011. In May 2011 FilAm-Memphis completed a one-week medical missions in Cebu, Philippines. Also in May 2011, Operation Smile completed its medical mission in Pozorubio, Pangasinan, Philippines. An alternative to participating on a medical mission is to sponsor a needy child or elderly person in the Philippines. This can be done through organizations such as CFCA. "For Attractive lips, speak words of kindness. For lovely eyes, seek out the good in people. For a slim figure, share your food with the hungry. For beautiful hair, let a child run their fingers through it once a day. For poise, walk with the knowledge that you never walk alone. People, more than things, have to be restored, renewed, revived, reclaimed, and redeemed. Remember, if you ever need a helping hand, you will find one at the end of each of your arms. As you grow older, you will discover that you have two hands, one for helping yourself and the other for helping others." That you do unto me. When I was thirsty, you gave me to drink. Now enter into the home of My Father. When I was naked, you gave me your coat. When I was weary, you helped me find rest. When I was anxious, you calmed all my fears.